"Dicot" redirects here. For the band, see Dicot (band). The dicotyledons, also known as dicots (or more rarely dicotyls), were one of the two groups into which all the flowering plants or angiosperms were formerly divided. The name refers to one of the typical characteristics of the group, namely that the seed has two embryonic leaves or cotyledons. There are around 200,000 species within this group. The other group of flowering plants were called monocotyledons or monocots, typically having one cotyledon. Historically, these two groups formed the two divisions of the flowering plants. Largely from the 1990s onwards, molecular phylogenetic research confirmed what had already been suspected, namely that dicotyledons are not a group made up of all the descendants of a common ancestor (i.e. they are not a monophyletic group). Rather, a number of lineages, such as the magnoliids and groups now collectively known as the basal angiosperms, diverged earlier than the monocots did. The traditional dicots are thus a paraphyletic group. The largest clade of the dicotyledons are known as the eudicots. They are distinguished from all other flowering plants by the structure of their pollen. Other dicotyledons and monocotyledons have monosulcate pollen, or forms derived from it, whereas eudicots have tricolpate pollen, or derived forms, the pollen having three or more pores set in furrows called colpi. Aside from cotyledon number, other broad differences have been noted between monocots and dicots, although these have proven to be differences primarily between monocots and eudicots. Many early-diverging dicot groups have "monocot" characteristics such as scattered vascular bundles, trimerous flowers, and non-tricolpate pollen. In addition, some monocots have dicot characteristics such as reticulated leaf veins. Traditionally the dicots have been called the Dicotyledones (or Dicotyledoneae), at any rank. If treated as a class, as in the Cronquist system, they could be called the Magnoliopsida after the type genus Magnolia. In some schemes, the eudicots were treated as a separate class, the Rosopsida (type genus Rosa), or as several separate classes. The remaining dicots (palaeodicots or basal angiosperms) may be kept in a single paraphyletic class, called Magnoliopsida, or further divided. 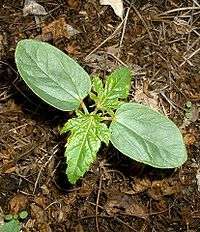 Some botanists prefer to retain the dicotyledons as a valid class, arguing its practicality and that it makes evolutionary sense. The following lists show the orders in the APG III system traditionally called dicots, together with the older Cronquist system. ↑ "Dicotyl". The Free Dictionary. Retrieved 2 January 2016. 1 2 "Monocots versus Dicots". University of California Museum of Paleontology. Retrieved 25 January 2012. ↑ Stuessy, Tod F. (2010). "Paraphyly and the origin and classification of angiosperms." (PDF). Taxon. 59: 689–693. Takhtajan, A. (June 1964). "The Taxa of the Higher Plants above the Rank of Order". Taxon. 13 (5): 160–164. doi:10.2307/1216134. JSTOR 10.2307/1216134.